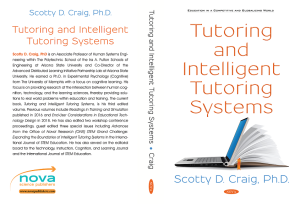 This book explores the intersection of tutoring and intelligent tutoring systems. The process of tutoring has a long history within learning settings. This effective method led to attempts to automate the process and the Intelligent Tutoring System research area. Intelligent Tutoring Systems (ITS) are increasingly being used in a wide range of educational settings to enhance student learning. They are also used frequently as platforms for research on educational psychology and artificial intelligence. ITS can assess a wide variety of learner characteristics and adapt instruction according to principles of learning. Their effectiveness allegedly derives from their ability to provide detailed guidance to learners and to adapt promptly to individual learner’s needs that are tracked at a fine grained level. Examples of such tutoring technologies included writing (but are not limited to) environments for guided inquiry learning, environments for collaborative problem solving or discussion, natural language processing and dialogue in tutoring systems, modeling and shaping affective states, interactive simulations of complex systems, ill-defined domains, and adaptive educational games. At their core, these systems rely on our basic knowledge of effective human tutoring. The book starts with a presentation of learning frameworks related to tutoring and ITS. This is followed by examples of best practices of tutoring and learning strategies implementing within specific ITS. Finally, it presents examples of evaluating effectiveness of tutoring systems. It is available in print and eBook format from the publisher and also on Amazon and Barnes & Noble. The target audience of this book spans researchers, practitioners, developers, and professionals. This multidisciplinary area synthesizes diverse contributions from education, psychology, learning science, computer science, software engineering, artificial intelligence, human factors, and user-experience design. This book was published by Nova Science Publishers, Inc. This publication was released Fall 2018. It is available in print and eBook format from the publisher and also on Amazon and Barnes & Noble.